A super-gentle facial masque formulated specifically for delicate, damaged or sensitive skin. 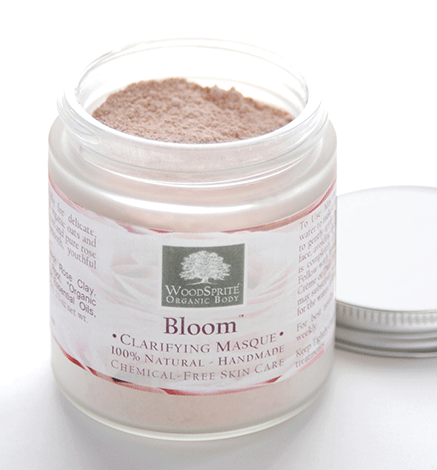 Powdered rose petals and organic oats and marshmallow soothe the skin, while organic comfrey root and pure rose essential oil nourish and moisturize for a clear, soft, smooth, youthful complexion. To Use: Mix one teaspoon of powder with enough warm water to make a thin paste. Use a cosmetic brush or fingertips to gently apply a thin layer of masque over freshly cleansed face, avoiding the eyes. Relax for a few minutes until masque is completely dry, then wet with warm water and rinse. Follow with Bloom Replenishing Toner and Bloom Hydrating Crème or Daily Moisturizer. TIP: For extra moisturizing, you may substitute warm fresh milk, yogurt, aloe or rose hydrosol for the water, following same procedure. Earn 24 Loyalty Points when you buy this item!